Transport For LondonThe chart shows maximum savings possible due to the cheaper all day PAYG caps. Transport of London (TfL) is introducing fare changes on the London Underground in January 2015 that should please part-time commuters. Under the revised changes, the daily cap on pay-as-you-go (PAYG) Oyster cards has been reduced to £6.40 if you’re travelling from Zones 1-2. That’s £2 less than the current peak daily cap of £8.40, and 60 pence less than the off-peak cap right now. 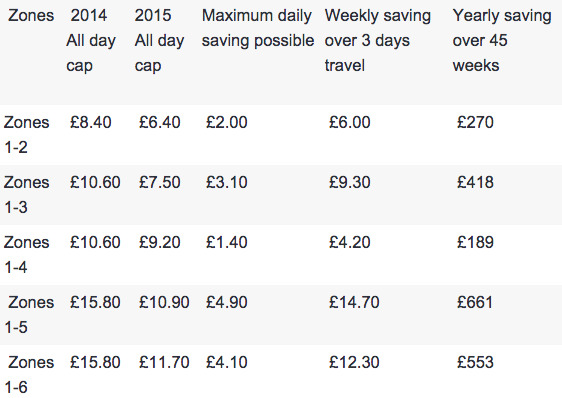 For Zones 1-6, the daily cap will be slashed by £4.00 from £15.80 to £11.70. (You can see all the changes in the chart on the right). The idea is to have part-time workers — who now make up 22% of London’s workforce — pay no more each week than full-time workers who buy a 7-day travelcard. “The new fares reflect modern-day travel patterns and deliver on a commitment by the Mayor to the London Assembly to address the specific needs of part-time workers in the capital,” TfL said in a media statement. The move should also rule out differences in paying with your Oyster card and paying with a contactless credit or debit card. Other prices are set to rise: Single rides will cost 10 pence more, meaning that if you were paying £2.20 this year for a Zone-1 commute, then next year it will cost £2.30, or 4.5% more. The Londonist reports that in January 2014 Boris Johnson had prompted TfL to review its price policies, looking for the introduction of a flexible 3-days-a-week plan for commuters who don’t work traditional office hours. Rather than introducing a new plan, TfL decided to reduce the daily cap.